Manual annotations are a prerequisite for many applications of machine learning. However, weaknesses in the annotation process itself are easy to overlook. In particular, scholars often choose what information to give annotators without examining these decisions empirically. For subjective tasks such as sentiment analysis, sarcasm, and stance detection, such choices can impact results. 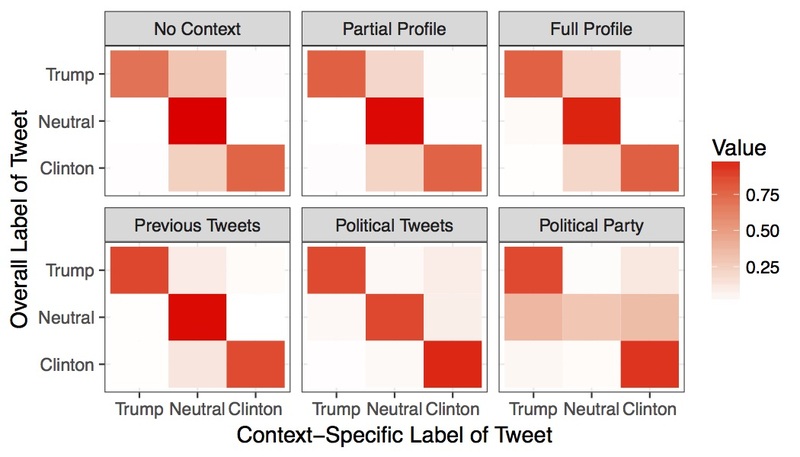 Here, for the task of political stance detection on Twitter, we show that providing too little context can result in noisy and uncertain annotations, whereas providing too strong a context may cause it to outweigh other signals. To characterize and reduce these biases, we develop ConStance, a general model for reasoning about annotations across information conditions. Given conflicting labels produced by multiple annotators seeing the same instances with different contexts, ConStance simultaneously estimates gold standard labels and also learns a classifier for new instances. We show that the classifier learned by ConStance outperforms a variety of baselines at predicting political stance, while the model's interpretable parameters shed light on the effects of each context.